Nosferatu, directed by FW Murnau in 1922, was the first telling of Bram Stoker's "Dracula" on film. The vampyre was played by Max Streck. Bela Balzacs, a German film writer of Hungarian descent, called the film "a chilly draft from doomsday". A crazed real estate agent in Bremen sends his recently married clerk, Harker, off to Transylvania, to the castle of Nosferatu, to settle some business affairs. The vampyr is attracted to a picture of Harker's wife and leaves for Bremen to find her, leaving a trail of death. The score, written by Richard Marriott with contributions by Gino Robair, was premiered at San Francisco State University for the BAVAC Awards Ceremony, April 16, 1989. The next two evenings it was persented at the Castro Theatre, San Francisco. Later that year it was featured on "Entertainment Tonight" with Leonard Maltin and performed at New Music America in New York. "Marriott suggests and parodies the sounds of Dracula's Transylvania with strains of Klezmer clarinet, Gypsy violin rhapsody, waltzes gone mad and darkly comic dirges. He's sprinkled comic musical touches throughout. And yet Marriott remains faithful to the spirit of the film while playing off a contemporary audience's comic reaction to a great old silent movie." "While Nosferatu isn't a film that's likely to date, such music makes it seem modern, even avant-garde." "But what Marriott has done here is to affectionately reconsider the possibilities through the musical filter of modern sensibility ... it brings the cinematic artifact to life, by carefully matching real-time music to reel-time film." "His soundtracks are like films for the ears - you can see the story just by hearing them." 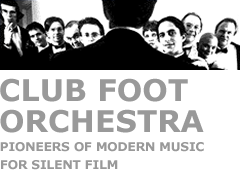 "The most impressive of these hybrids was the FW Murnau classic 'Nosferatu' - the first Dracula film - with music by the Club Foot Orchestra, a San Francisco group that has pioneered the moden use of live music with silent film. This nine-piece band flawlessly performed a score carefully matched to every piece of on-screen action in what amounts to an hour-long suite of epic proportions."